The Chelsea Improvement Company bench is inspired by the constant movement and urban rhythms of New York City. It also relates to the new New York City stainless steel-and-glass bus shelters. The three seats on each bench have generous proportions to accommodate a wide range of people, and make sure people aren't too close together when sitting, a common complaint about public seating. 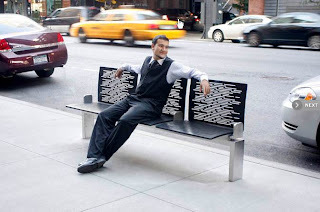 The product was approved in early 2010 by the New York City Department of Transportation and the New York Public Design Commission and is now being considered as a possible standard bench for the entire city.